Most of us know that air conditioning systems require routine maintenance to operate efficiently. But if you have pets, there are specific maintenance areas that need to be addressed. 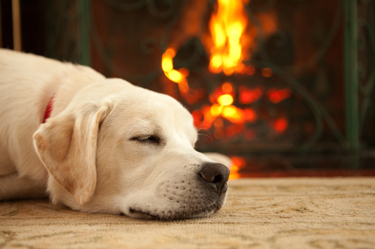 Whether you have cats, dogs, or other furry friends and regardless of whether they live inside or outside, certain steps and precautions should be taken to keep pets safe and your HVAC system running smoothly. Change filters often. Pet hair and dander clog up filters, blocking air flow and allowing your system to get dirty inside. Typical households should change air filters every 6 months. Pet owners, especially those with multiple pets or long haired pets, should change filters quarterly or even monthly. Protect the outdoor unit. If your pets, especially dogs, have free reign in the area that contains your outdoor AC unit, they are likely to use it as a place to lift their leg. Pet urine can cause corrosion and other damage to the unit. Pets may also claw the outdoor unit, causing damage or injuring themselves. Enclose your outdoor unit with fencing or some other barrier that allows for air flow. Secure electrical cords. Pets like to chew on electrical wires and cords, which is dangerous for them and can cause damage to the wires. Enclose electrical wires in conduits. Keep pets clean and well groomed. Bathing pets and brushing off excess hair, even having them professionally groomed can reduce the amount of hair that is loose in your home. Less hair laying around means less will end up in your filters and ducts. Vacuum up pet hair regularly. Keeping pet hair in check with frequent vacuuming reduces the amount of hair and dander that can be sucked in by your intake vents. A yearly tune up for your AC offers a range of benefits. A well maintained system will give you many more years of good operation than a system that isn’t. And keeping your AC tuned up means it will run more efficiently, using less energy and keeping your monthly bill lower. You won’t have to worry that your AC will break down in hot weather, because a typical yearly checkup will catch any potential problems like parts that are wearing out or loose. Pets put an added strain on your air conditioning system because of the hair, dander, and dirt that invade your vents and ducts. But you can combat this with yearly maintenance and by following the tips listed above. Carolina Fuels offers Comfort and Protection Service Plans that include yearly tune ups for your air conditioning, furnace, and any other HVAC equipment you own. Service plans can also be combined with fuel delivery such as propane, heating oil, and more. Your total home comfort can be managed by just one company. Sign up for a service plan today to keep your HVAC system in the best possible condition. Call (336) 623-9741.